On Sunday, October 7th, at 7:21 p.m. PDT, SpaceX successfully launched the SAOCOM 1A satellite from Space Launch Complex 4E (SLC-4E) at Vandenberg Air Force Base in California. The satellite was deployed about 12 minutes after liftoff. The launch of SAOCOM 1A is for a customer, CONAE. CONAE is the Government of Argentina’s National Civilian Space Agency, who together with INVAP, VENG, and CNE, developed and built SAOCOM 1A in Argentina. The partnership included Italian Space Agency (ASI) in SIASGE technical support from ESA (Europe), CSA (Canada), and NASA (USA). The mission was conceived in the Argentine National Space Program to create technological capabilities for the benefit of the country. The control center of SAOCOM 1A is located in the Teófilo Tabanera Space Centre of CONAE in Córdoba, Argentina. 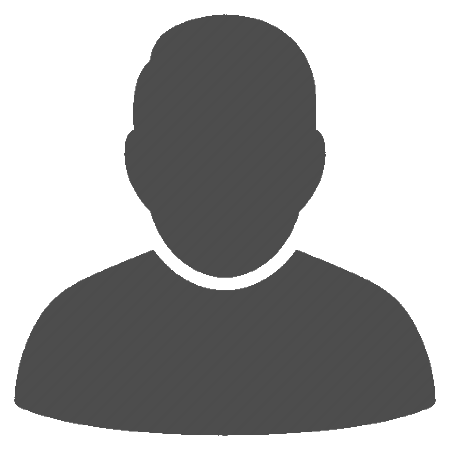 It controls the satellite’s health, uploads commands, download data and distributes data users in Argentina and around the world. Falcon 9 is a two-stage rocket designed and manufactured by SpaceX for the reliable and safe transport of satellites, and the Dragon spacecraft, into orbit. Falcon 9 is the first orbital class rocket capable of re-flight. SpaceX believes that rocket reusability is the key breakthrough needed to reduce the cost of access to space and enable people to live on other planets. Falcon 9 made history in 2012 when it delivered Dragon into the correct orbit for rendezvous with the International Space Station, making SpaceX the first commercial company ever to visit the station. Since then Falcon 9 has made numerous trips to space, delivering satellites to the orbit as well as delivering and returning cargo to and from the space station for NASA. Following stage separation, Falcon 9’s first stage returned to land at SpaceX’s Landing Zone 4 (LZ-4) at Vandenberg Air Force Base. This was SpaceX’s first land landing on the West Coast. LZ-4 is built on the former site of Space Launch Complex 4W, from where Titan rockets were previously launched. The main objective of SAOCOM 1A is to measure soil moisture from space. It is a first radar satellite dedicated to agricultural production and hydrology. The main objective of SAOCOM 1A was to measure soil moisture from space, and it is the first radar satellite dedicated to agricultural production and hydrology. SAOCOM 1A, with the resolution and coverage area available for the first time in Argentina, will be used to generate daily soil moisture maps, identify areas at risk of flooding and give early warning signs. The satellite will also help in detecting very dry soils with fire risks and obtain glacier displacement maps. It will also be able to evaluate scenarios for planting and fertilization decision making. Maps of risk of crop diseases can also be produced with help of SAOCOM 1A. It also integrates the SIASGE, the Italian Argentine satellite system for emergency management. 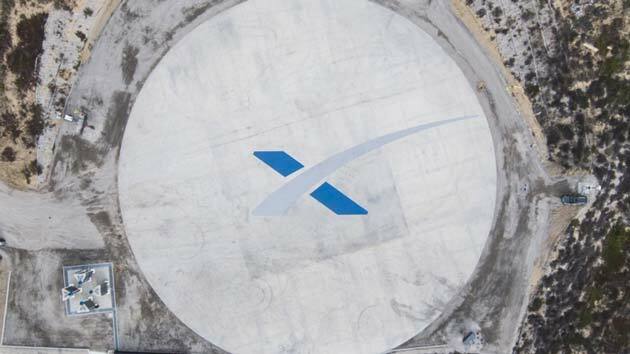 According to Space.com, SpaceX has landed more than two dozen Falcon 9 first stages, but this would be the first to touch down on the West Coast. The other landings have occurred at Florida's Cape Canaveral Air Force Station, or on robotic "drone ships" stationed in the Atlantic and Pacific oceans. 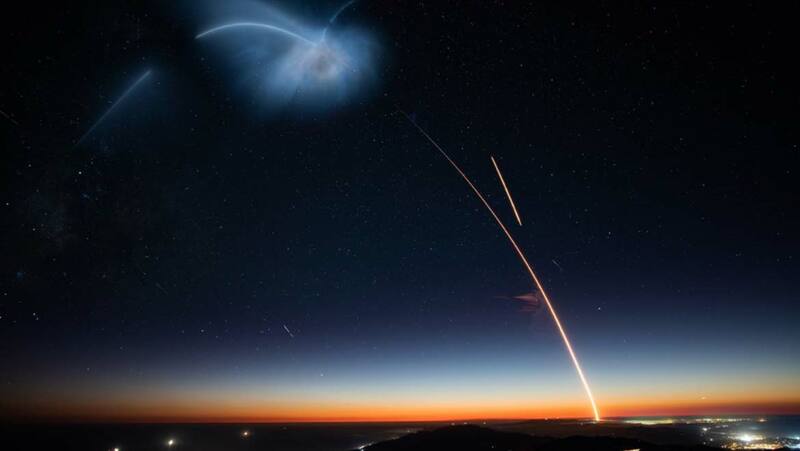 The rocket's return to Earth made quite an impression on people living near Vandenberg. It occurred just as was indicated by U.S. Air Force officials before the launch, "Local residents may see the first stage of the Falcon 9 returning to Vandenberg AFB, including multiple engine burns associated with the landing. During the landing attempt, residents from Santa Barbara, Ventura and San Luis Obispo counties may hear one or more sonic booms." There was yet more action: SpaceX's speedy, net-equipped boat, Mr. Steven, apparently tried to catch SAOCOM 1A's falling payload fairing. The payload fairing — the protective nose cone that surrounds a satellite during launch — costs about $6 million to make anew for each launch, as Elon Musk previously said. Catching and reusing it (or at least half of it; the fairing falls to Earth under a parachute as two separate halves) makes a lot of economic sense. SAOCOM 1B, a similar project will also reach the orbit aboard a Falcon 9; its flight is targeted for next year. 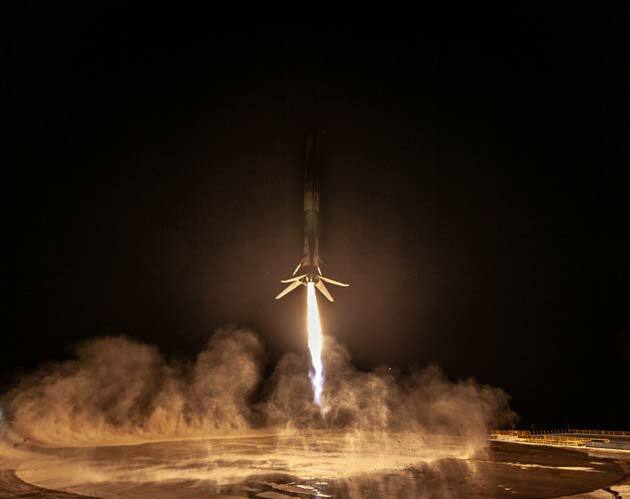 This is not "The lift-off of SpaceX’s Falcon 9 from an air force base in California." The legs of the Falcon 9 are NOT deployed on lift-off. They are deployed just before landing. This is the last second before the touchdown landing of the rocket.